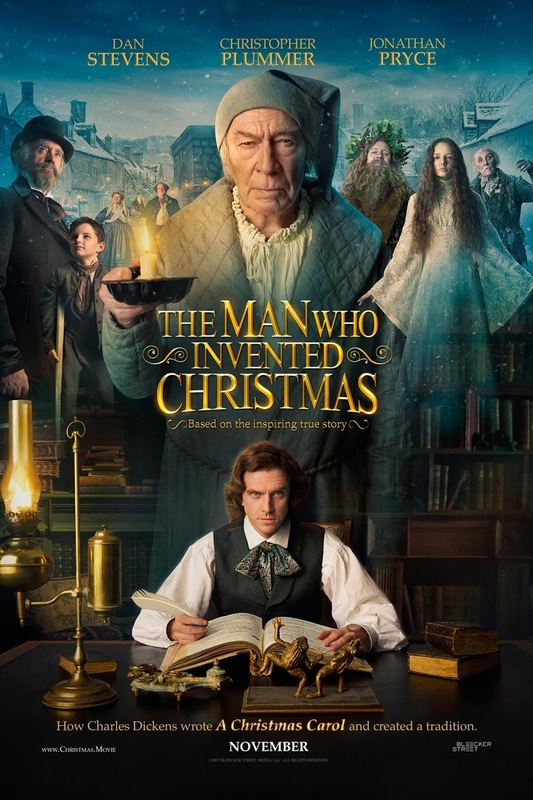 Movie: "The Man Who Invented Christmas"
Charles Dickens struggles to write and self-publish one of his most famous books, "A Christmas Carol," just six weeks before the holiday. "A Christmas Carol" is synonymous with Christmastime. It's a story that has been read and passed down for over a century. It has also been adapted into numerous films and animated specials. Actors like Alastair Sim, Reginald Owen, George C. Scott, Bill Murray, Patrick Stewart, and Jim Carrey have all played some variation of Dickens' main character Scrooge. Heck, even Micky Mouse, Mr. Magoo, and The Muppets all have their own version of this classic story. "The Man Who Invented Christmas" is the tale of how Charles Dickens wrote his famous book that imbues the spirit of Christmas into anyone who has read it. The film is directed by Bharat Nalluri and is written by Susan Coyne, based on the non-fiction book of the same name by Les Standiford. The film stars Dan Stevens as Charles Dickens who, after three flops in a row, is desperate to come up with a new book that is a smash success. His latest idea is a Christmas ghost story about a stingy miser who is visited by three spirits on Christmas Eve to warn him of the dangers of greed and selfishness. His publishers aren't all that interested in this type of a novel since "Christmas is only a minor holiday." They don't believe there is a market for it. Frustrated, Dickens decides to publish the story himself at a great personal expense, which could break him if his project fails. Being a period piece and a biopic, there was a good chance this could have been stodgy and boring. It could have taken a very clinical look at the life of Charles Dickens, but luckily, Nalluri and Coyne do a wonderful job making this a fun and humorous biopic. The film tries to juxtapose a CliffsNotes version of the story of "A Christmas Carol" with Dickens' life itself. It draws parallels between things that happened in his life which inspired the biggest parts of his famous tale. These little bits of fan service will bring fabulous nostalgic joy to the viewer, which is what we are really in search of during Christmastime. Dickens' characters come to life all around him with Christopher Plummer playing the famous role of Ebenezer Scrooge. Plummer is magnificent as this grizzled, cantankerous, obstinate character, and the film left us longing to see Plummer play the full role of Scrooge in someone else's movie. Make it happen, Hollywood! We see how the people in Dickens' life inspired him as well, people like his father John, played by Jonathan Pryce, his wife Kate, played by Morfydd Clark, his friend and agent John Forster, played by Justin Edwards, and even his housekeeper Tara, played by Anna Murphy. All of these individuals bring their own perspective and inspiration for Dickens as he struggles with a six week deadline to complete his book before Christmas day. The acting is great as Stevens plays Dickens a little screwball and Plummer does his grouchy thing with relative ease. "The Man Who Invented Christmas" does feel a bit schmaltzy at times, but we still had a lot of fun with it and enjoyed the film overall. It does enough different with the material that it doesn't feel like a straight remake of "A Christmas Carol," and it has a lot of wacky and heartstring-tugging moments to keep viewers interested, captivated, and longing for yuletide cheer.